Vale line commuters could pay a heavy price if a proposed rail spur to Cardiff Airport goes ahead. The Vale of Glamorgan’s recently published Local Development Plan envisages a railway spur from the Vale Line west of Barry to the Airport. The introduction of rail services direct to the airport could well be at the expense of the frequency and quality of services available to commuters on the Vale Line. And yet, there’s little evidence that a direct rail line will help reverse Cardiff Airport’s recent decline. The solid red line depicts the proposed new rail spur leading to the airport. The Vale Line and the airport railway spur will compete for line capacity and for financial support. The Vale Line, re-opened in 2005, has been a growing success with passenger journeys to and from Rhoose and Llantwit Major, rising from around 300,000 in 2005/06 to 360,000 in 2008/09. With only an hourly service beyond Barry to these stations at present, it’s yet to reach its full potential. Planned Enhancement Works between Barry and Cardiff open up the possibility of much increased frequency, but the Vale Line and the airport spur will compete for that increased capacity. Half-hourly services from Cardiff Central to Cardiff Airport are envisaged, and advocates of the railway spur argue also for extending mainline services from Gloucester, Bath and Bristol to terminate at Cardiff Airport. Ultimately these airport services threaten the frequency of trains to stations West of the spur, notably Rhoose and Llantwit Major. The airport spur doesn’t just compete for line capacity, it will also compete for financial support. The low levels of likely usage of the spur, possibly as low as 100,000 passenger journeys a year, mean that the spur will always require considerable public subsidy. Many more people use the Vale line. and more again would use it if the service frequency increased. More trains will require some increase in the financial support given to the Vale Line – an increase in support that is currently unbudgeted. There has to be a very real concern that, in the fight for resources, the bread and butter but valuable Vale Line ends up losing out to the politically more appealing but, in reality, less valuable airport railway spur. What’s more, the construction costs of the airport spur may mean that the Vale Line could miss out on the biggest upgrade of rail services in South East Wales for a generation. Ambitious plans are afoot to create a South Wales Metro built along a network of newly electrified lines running from Bridgend to Newport and from Penarth to Merthyr – with more regular, more reliable, faster and cheaper-to-run services transforming the “travel to work” times across South-East Wales. The economic case for the investment is very strong. The debate is about which lines are to be included and which are to be excluded. The costs of electrification of the Vale Line, at around £20-30m, are in the same ball park as the public subsidy likely to be required to fund the construction of the railway spur. There is a real risk it’s “either/or” rather than “both”, and that the Vale Line gets left out of the Metro plans. The success of Cardiff Airport is in the interests of the people of the Vale, some of whom work there and many of whom use its services. 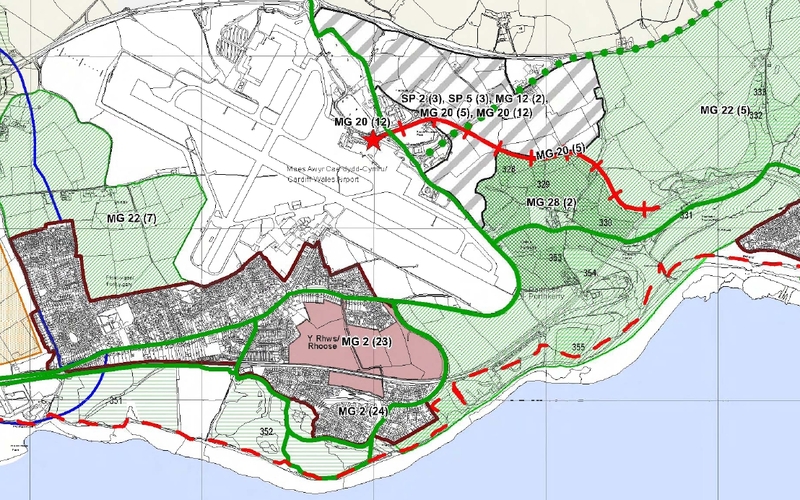 Sadly, the airport railway spur, although a politically attractive, headline-grabbing initiative, is unlikely to make much of a difference to the long-term health of Cardiff Airport. This is not only because most people prefer to travel to regional airports like Cardiff by car, but also because Cardiff Airport already enjoys a better rail link than most regional airports. In fact, data presented by Cardiff Airport to the Welsh Affairs Committee, showed that ‘ease of access’ to the airport was near the bottom of the list of reasons for travellers not using CardiffAirport. Only 2% to 3% of those surveyed described it as the main reason they didn’t use Cardiff Airport more often. Bristol Airport has no rail service at all and yet it is thriving. Meanwhile, the substantial improvement to Cardiff Airport’s rail provision, when the Vale Line re-opened in 2005, was not able to slow the Airport’s decline. There is currently an hourly service to Rhoose Cardiff Airport station from both Cardiff and Bridgend. A shuttle bus service takes passengers to the terminal. The shuttle bus is quicker than the service between many long-stay car parks and terminals in other airports. Before the opening of the Vale of Glamorgan line only 2% of Cardiff Airport’s users got to the airport by train and bus. A recent survey shows that percentage has risen to over 9%. The prospect of more trains to Rhoose, following the completion of engineering works, will make that existing link even better in a few years time. Upping the frequency of the Vale rail service to Rhoose Cardiff Airport to half hourly, or even every 20 minutes, which would be possible if the spur wasn’t competing for capacity, would provide a service only a little less appealing than the service provided by a spur direct to the terminal. Indeed for rail passengers coming to the Airport from Bridgend, Swansea and west Wales, the spur would leave them worse off. Were the spur ever to be built, these passengers would be forced to travel via Cardiff, given the resulting unviability of a Rhoose-Airport shuttle service. The Vale of Glamorgan Council should re-consider the inclusion in the Local Development Plan of a railway spur direct to the airport. Their priority should be to provide the best possible service to the current and future users of the Vale Line, and in doing so significantly improve the quality of the current rail provision to the airport by upping train frequencies to Rhoose Cardiff Airport. The airport spur will be an expensive white elephant which will compete for money and line capacity with the Vale Line and drain resources from more worthwhile transport priorities, yet without helping to reverse Cardiff’s Airport’s decline.